Economic activities are inextricably linked to our everyday lives, in aspects such as changes in prices of various products and economic fluctuations. Among these economic activities, there is research that look at short-term fluctuations as well as research themes that take a medium- to long-term perspective. 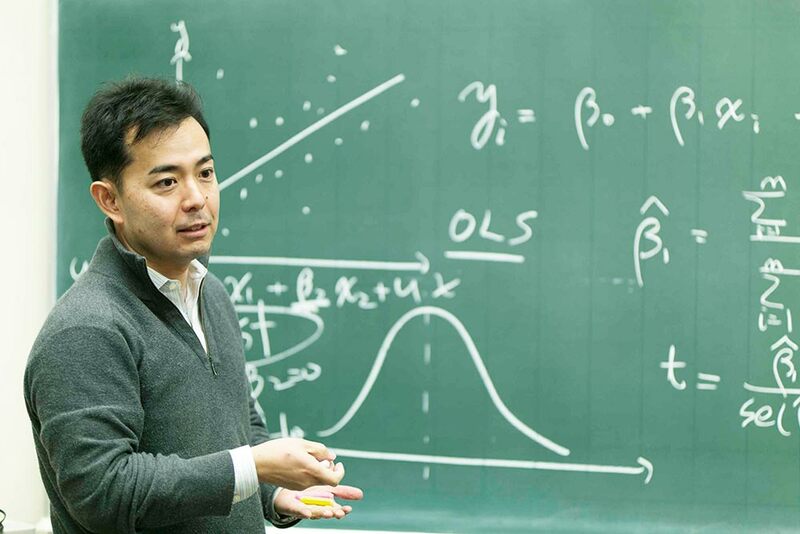 Associate Professor Tatsuma Wada engages in research on the impact of fluctuations in crude oil prices on economic activities at the industry and national levels, and explores if the model (*1), which has been believed to be symmetric, can in fact work better in explaining the real world when asymmetry is allowed. （*1) Models of the characteristics of society’s economic structure, used in economic analysis. Can time-invariant parameters（*2) actually change over time? My academic work mainly lies in the field of international macroeconomics, or international finance, and there are two key elements that I focus on. The first is the types of processes through which exchange rates are determined. The second is how the international balance of payments is determined, and in particular, what impact fluctuations in crude oil prices have on the balance of payments. My work attempts to shed light on these questions. I have had a keen interest in economics since my days as an undergraduate student. Within that, I had especial interest in the historical aspects of economics, including questions such as what a country and economy need to grow and develop in the long-term, what are the mechanisms that give rise to economic fluctuations, and why some countries succeed in economic growth while others fail. 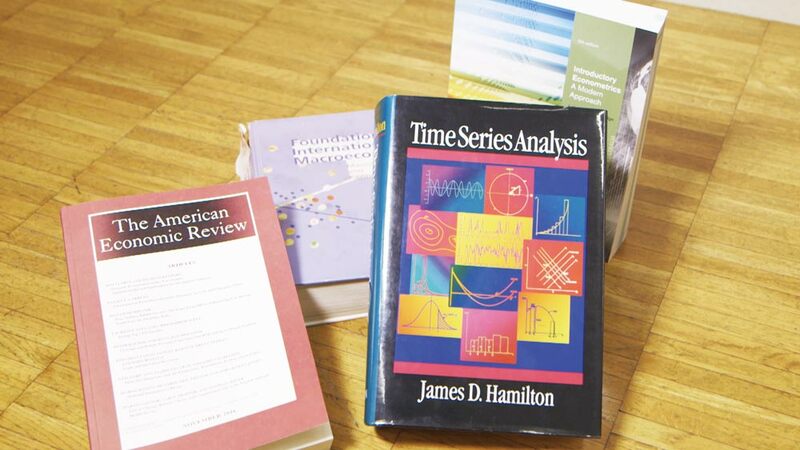 As I continued studying these topics, I eventually arrived at the field of macroeconomics. Alongside international macroeconomics, I also engage in research on econometrics, which involves developing tools to analyze macroeconomic data. My research is centered around the hypothesis of whether parameters used in models, which have always been considered to be constant values regardless of time, can in fact change with the passing of time. （*2) Economic models contain “economic variables,” which are impacted by changes in the external environment, and “parameters,” which are not impacted by changes in the external environment. If we were to use the example of an algebraic formula, in “3x + 2y = 6,” x and y would be the variables, while 3, 2 and 6 would be the parameters. As exchange rates vary from day to day for various reasons, it is difficult to forecast future values. Nevertheless, there are many approaches to making such forecasts, and an example would be forecasting future exchange rates based on the current amount of trade. I also use data and models that I have built myself to attempt to present such forecasts in a convincing way. Of these, I use the non-linear model as a tool. One of the themes that I research is fluctuations in the amount of trade as a result of crude oil prices. When crude oil prices rise, the amount of trade falls, and when crude oil prices dip, the amount of trade rises; this is the relationship between the two factors. If the changes in the former and the latter are of a similar extent, we can say that they are symmetrical; however, the impact that rises and falls in crude oil prices have on the amount of trade is probably not always symmetrical. Based on this premise, I draw up estimates using models that allow for asymmetry. This approach is very peculiar to my research. Parameters may undergo certain changes along with the passing of time. Acknowledging and allowing for such changes can make the models themselves more flexible, and harnessing models armed with this flexibility can help us distinguish the periods when the theory is applicable from the periods when it is not. An example of changes to trade volume resulting from rise in the crude oil price (blue) and changes to trade volume resulting from fall in the crude oil price (orange): In the first few months, the rise and fall in crude oil prices and the impact on changes in the amount of trade have a symmetric relationship. However, after that, the rise and fall in crude oil prices bring about different changes respectively, and the relationship becomes asymmetrical. I have written a paper analyzing how fluctuations in crude oil prices affect economic activities. A rise in crude oil prices brings about an increase in costs for most production activities, thereby resulting in a decline in these production activities. Conversely, a drop in crude oil prices leads to cost reduction, and production activities are expected to grow in turn. One of the themes I covered was whether these changes in production are of the same extent, which is to ask whether they are symmetrical reactions. Hypothetically, when prices rise, it would be easy for the production side to shut down and reduce production volume. However, when the situation is reversed, it would first be necessary to invest in and expand production capacity in order to increase production volume. Hence, production volume cannot increase immediately. Can we not describe this as an asymmetrical reaction? This was the question that only few economists ask, me included. To examine this, I adopted the method of researching each industry in detail while providing for tolerance using an asymmetric model. After categorizing industries into as many as 36 sectors, I found that there are sectors that do not use much petroleum to begin with, as well as sectors such as crude oil mining and oil refining that generate profits more easily and experience an expansion in production activities when oil prices increase. After conducting research on various sectors including these sectors, I found that a symmetric relationship exists between the crude oil price and the reaction of the current account balance for most sectors. Research on whether there is symmetry in the degree of growth/decline in production activities against fluctuations in crude oil prices. Based on the premise that the impact that the rise and fall in crude oil prices has on the amount of trade is not always symmetrical, estimates are drawn up using models that allow for asymmetry. In considering asymmetry with crude oil prices, I studied member states of the Organisation for Economic Co-operation and Development (OECD). With regard to the method employed, I considered if differences in symmetry and asymmetry would emerge among the countries, in the same way they did for the different industries used in my analysis of the relationship between fluctuations in crude oil prices and production volume in different industries. To give an example that is easy to grasp, two of the countries that I actually used in my study were Norway, an oil-producing country, and Japan, which generates high demand for petroleum. In oil-producing countries, production volume increases when crude oil prices rise, and falls when crude oil prices drop. The reverse is true for Japan, where production comes to a standstill when crude oil prices rise, resulting in a fall in production volume. However, in this study, symmetry was generally identified. However, the fact is that a slightly different trend has been occurring after the 2000s. People began to think of a rise in crude oil prices as a signal that the economy would improve, perhaps as a reaction to the significant downturn in crude oil prices; as a result, stock prices have continued to rise. Based on this, it is possible that the response of economic activities to fluctuations in crude oil prices can change with the passing of time. Going forward, I would like to examine, through my research work, if there are any possible effects through exchange rates. In oil-producing countries, production volume increases when the crude oil price rises, and falls when the crude oil price drops. The reverse is true for Japan, where production comes to a standstill when the crude oil price rises, resulting in a fall in production volume. 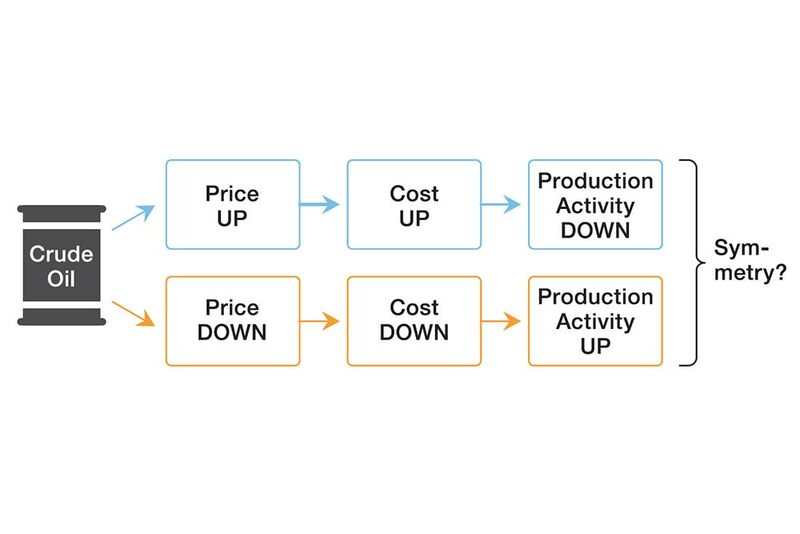 There are differences in the growth/decline of production activities as a result of fluctuations in the crude oil price between oil-producing and oil-consuming countries. I enjoy studying economic fluctuations from a historical perspective, and have focused my research on the factors that trigger the emergence of medium- to long-term waves. I also sense new potential in building a model that incorporates the concept of money into this research. Traditional economic cycles occur in periodicity ranging from two-and-a-half years to eight years. Those who are interested in this classical cycle, and in particular the so-called “real business cycle,” tend to have little interest in short-term fluctuations. I, too, have been taking this standpoint that it is acceptable not to place too much focus on the concept of money. To put it very simply, prices should eventually rise if we were to distribute money to people. In the medium to long run, however, money only affects the price level, not the real economy. So, I have rather been interested in the mechanism by which changes in crude oil prices affect economic activities, to this end, I have employed the models allowing for time-varying parameters or asymmetry in order to elucidate the impact on economic activities. Associate Professor, Faculty of Policy Management, Keio University. Completed the Master’s Program at the Graduate School of Economics, Keio University, in 2001. In 2006, he received his Ph.D. in Economics from Boston University. Areas of specialization include international finance, econometrics, and macroeconomics. 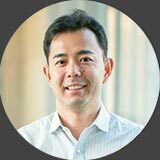 Before taking up his present post in 2015, previous positions include Assistant Professor, Wayne State University, USA.